The special edition Documentation of Foreign Policy 2001 “Austrian Measures on Restitution and Compensation for Victims of National Socialism” forms a fundamental basis for the work of the National Fund of the Republic of Austria and the General Settlement Fund. The Documentation of Foreign Policy contains historical documents such as the Moscow Declaration on Austria 1943, the State Treaty of Vienna 1955 and the Exchange of Notes between Austria and the USA on Article 26 of the State Treaty, as well as documents on the Republic of Austria’s measures to provide compensation and restitution from 1945 up to and including the more recent statutory bases for Austrian compensation and restitution policies for the victims of National Socialism. The documentation is now available in digital form with the kind permission of the Federal Ministry for European and International Affairs and the University and Provincial Library of Tyrol. The table of contents below contains links to the respective documents on the website of the University and Provincial Library of Tyrol. Alternatively, documentation can be downloaded in its entirety as a PDF file. Bundesministerium für Auswärtige Angelegenheiten [Austrian Foreign Ministry] (Ed. ): Österreichische Maßnahmen zur Restitution und Entschädigung von Opfern des Nationalsozialismus [Austrian Measures on Restitution and Compensation for Victims of National Socialism]. 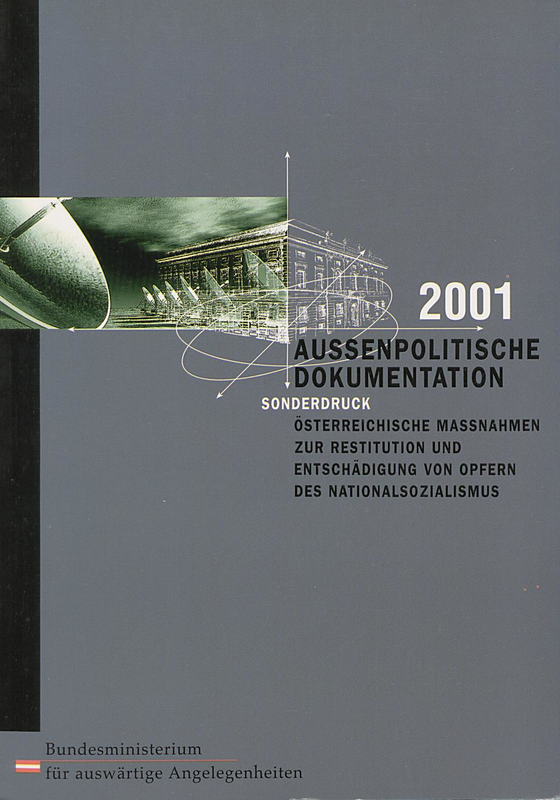 Vienna 2001, (=Außenpolitische Dokumentation 2001, Sonderdruck), 253 pages.